Excellent company with great understanding to design and detail. Quality of merchandise is second to none. Would recommend this company for all your sanitary ware, shower fittings and tile needs. Absolutely brilliant! if you're building or doing a refurb.. this is the place for you. Purchased floor tiles. ..bathroom wall & floor tiles...wet room/shower fittings. Professional efficient & friendly service & all at a truly competitive rate. Nothing was too much trouble. Thank you Des Aisling Ferghal & team you eased the stress of living through a renovation! Recently purchased a stove. Aisling was so helpful and patient. We didn't feel pressured into buying. When we returned to buy she was again extremely helpful, going over our requirements to make sure we got exactly what we wanted/needed. Excellent service and great price too!!! Fabulous showroom, knowledgeable staff, outstanding customer service. 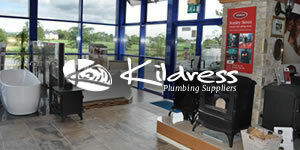 Looking forward to purchasing our stoves for our new build from the professional team at Kildress Plumbing Suppliers. After pricing around most of the stove show rooms from Newtownards to portadown i finally bought a stanley stove and flexy flue and fittings from Kildress plumbing supplies today, it was an absolute pleasure to have met Robert... he couldnt have been more helpful and took the time to advise us on our best options, a true and honest gent he is !! rare these days!! thankyou Robert and thank you Kildress plumbing supplies, a top notch outfit. Great service, sales advice and value for money. Would definitely recommend. Top products at best prices and first class service to back it up. Thank you Kildress Plumbing ! We always receive fantastic customer service and excellent quality products from yourselves ! Merry Christmas !